Image caption Prime Minister Hun Sen said if the bill was not paid the paper should "pack up your things and leave"
One of Cambodia's last independent newspapers, the Cambodia Daily, has announced it will close after the government ordered it to pay a huge tax bill. The paper, which is often critical of the government, said it had been destroyed by the $6.3m (£4.9m) bill. Earlier on Sunday, Cambodia's opposition leader, Kem Sokha, was arrested on treason charges. He has been accused of conspiring with unnamed foreigners to harm the country. The arrest was one of a series of recent moves against political opponents and organisations deemed critical of Prime Minister Hun Sen's administration. In August, Mr Hun Sen, a former Khmer Rouge commander in power for more than 30 years, reportedly called the publishers of the Cambodia Daily "thieves" and said if the bill was not paid within 30 days the paper should "pack up your things and leave". In a statement confirming the closure on Sunday, the paper said: "There may well be a legitimate dispute between the tax department and the owners of the Daily over when tax became collectable and in what amount. In an ordinary process, matters in dispute would be resolved after an audit and private negotiations. "Instead, the Daily has been targeted with an astronomical tax assessment, leaks and false statements." The paper, which was founded in 1993, will cease publication on Monday. The Cambodian government has previously threatened to shutter media outlets they say jeopardise "stability" in the country. 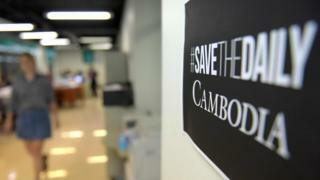 Aside from the Cambodia Daily, other independent media outlets - including the US government-funded Radio Free Asia and Voice of America - have also reportedly been accused of not complying with tax obligations. These outlets frequently report on topics that embarrass the government, such as corruption and human rights abuses. The US State Department has said it is "deeply concerned by the deterioration in Cambodia's democratic climate" in recent weeks. But the Cambodian government denies the cases are political, saying critical journalists have considerable freedoms in the country.